Saint-Saëns was born in Paris in 1835 and spent much of his professional life in the city. Like Mozart before him, the young Saint-Saëns was a prodigious talent, composing his first piece for piano at the age of 3 and making his formal debut at the age of 10 in a programme of Mozart and Beethoven piano concertos. After this concert Saint-Saëns asked his audience to choose one of the 32 Beethoven Piano Sonatas, all of which he knew by heart, to play as an encore. He entered the Paris Conservatoire in 1848 (aged 13) and studied organ and composition. By 1857 he was installed as organist of La Madeleine where Liszt was to hear him play before proclaiming him the greatest organist in the world. As a performer he championed the cause of the then unpopular Schumann, Wagner and Liszt in Paris. He was also a passionate advocate of French contemporary music, founding in 1871 the Société Nationale de Musique with the explicit purpose of promoting new works in a musical environment dominated by the German classics. Sadly this zeal for promoting modernity was to wane in later life as he faced what he considered to be the disturbing trends of Stravinsky, Debussy and Richard Strauss. As a composer he is often dismissed as not quite the equal of a Mozart, Beethoven or Brahms, yet his music betrays a mastery which is disguised by his natural conservatism in form and harmonic language. One of his best known works “The Carnival of the Animals” (completed just after the Violin Sonata you will hear this evening) is a masterpiece of comic wit, gently mocking the music of Offenbach, Berlioz, Mendelssohn and Rossini. Amazingly Saint-Saëns only permitted the publication of the Swan from this work during his lifetime, fearing for his reputation as a serious composer and considering the work a comic diversion. The Sonata we perform tonight was written in 1885 and has a similar structure to the third “organ” symphony (of 1886) in that what is essentially a four movement work is fused into two, unbroken halves. The opening Allegro agitato uses dazzling rhythmic creativity to establish a dark and forboding atmosphere, juxtaposing melodic pairs of notes against the inherent triple character of the metre. 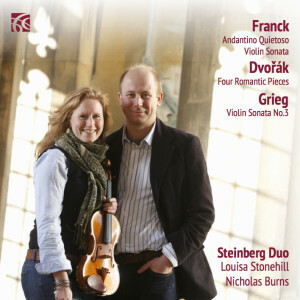 Waves of dramatic, terse writing are contrasted with ethereal passages of soaring violin melodies accompanied by gently rippling piano writing. Eventually the calmer mood wins out with the violin melody coming to rest on a single B-flat before the piano warmly introduces the simple rising motive of the Adagio. Throughout the breathtaking beauty of the slower writing, Saint-Saëns plays with rhythmic ambiguities, deliberately contradicting his chosen metre and creating the impression that the music is seamless, lacking the usual divisions of bars or beats. This gives the movement an improvisatory character and the listener an extended respite from the drama of the opening. The second half of the work opens with a Scherzo full of wit and humour. Endless short notes keep the mood light and again expectations are challenged with rhythmic invention. Saint-Saëns’s musical background as a church musician is evident in the short piano chorale which acts as a bridge to the Allegro molto. The finale can only be described as an explosive statement of virtuosity, but listen out for the peels of bells towards the end, a Parisienne theme of which we will hear more later!